A family favorite around here – and oh so quick and easy! Season chicken with salt/pepper & teaspoon garlic powder. Heat skillet to 300 degrees, add butter and chicken breast slices…sauté for 5 minutes tossing while browning. Then add mushrooms, a dash more salt & pepper. 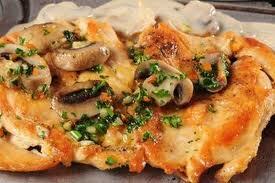 Flip chicken and mushrooms for another 2 minutes, browning everything on all sides. Add lemon juice, wine and apple juice, scraping bottom of skillet for all those amazing tidbits and sauté for additional 2 minutes. Put everything onto a platter, top with a sprinkling of shaved Parmesan and enjoy! We actually love to pour the whole mixture over some al dente penne pasta or linguine—even jasmine rice. Pair with a nice salad or crusty loaf of bread and life is grand! You may also want to add….toasted pine nuts, dried cranberries or a little sprig of rosemary to the mix. If you like it spicier, toss in a few red pepper flakes or a couple shakes of chili powder. Experiment! Oh and by the way – Hailey says – don’t eat the flower! We love chicken picata in my house! (And it usually brings a few friends out of the woodwork too!) It’s fancy enough for company and yummy enough just for family! Hope you like it! Season chicken with salt and pepper. Dredge chicken in flour and shake off excess. In a large skillet over medium high heat, melt 2 tablespoons of butter with 3 tablespoons olive oil. When butter and oil start to sizzle, add chicken and cook for 3-4 minutes. When chicken is browned, flip and cook other side for 3-4 minutes. Remove and transfer to plate. Into the pan add 2 tablespoons butter and mushrooms. Sauté mushrooms until brown on both sides. 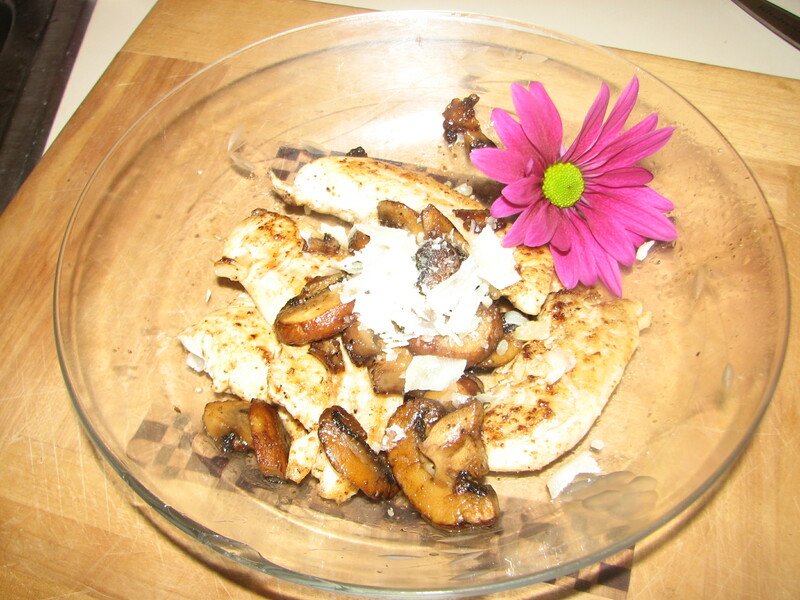 Remove mushrooms to plate with chicken. Next, add lemon juice, white wine, stock. Return to stove and bring to boil, scraping up brown bits from the pan for extra flavor. Check for seasoning. Return all the chicken to the pan and simmer for 5 minutes. Remove chicken to platter. Add remaining 2 tablespoons butter to sauce and whisk vigorously. Pour sauce over chicken and garnish with parsley, Parmesan and lemon slices. Some people like capers on theirs — (my kids aren’t keen on them!) If you like them, add a tablespoon of them in when you’re whisking the wine, stock & butter together for the sauce. I usually serve with a salad and plate of linguine – pouring the sauce/chicken goodness over the top of the pasta and topping with some shaved Parmesan!